Laura, dear, what will you wear? The #SeattleBundas are back at it. This time we have an amazing itinerary over the next seven and a half weeks taking us all over western Europe: Frankfurt, Wurzburg, and Rothenberg ob der Tauber, and Weil am Rhein, Germany; Paris (including Disneyland) and Maison-Laffitte, France; Brussels, Belgium; London, Bath, Clevedon/Somerset, and Haywards Heath, England; Rome, Florence, Cinque Terre, Milan, and Venice, Italy; Thun, Switzerland. We also have a one-week Adriatic Cruise starting/ending in Venice, Italy and visiting the following along the way: Dubrovnik and Split, Croatia; Ancient Athens, Greece; and Ancient Ephesus, Turkey. As many of you know, we have been committed to the carry-on only, One-Bag travel philosophy now since the beginning of the year. 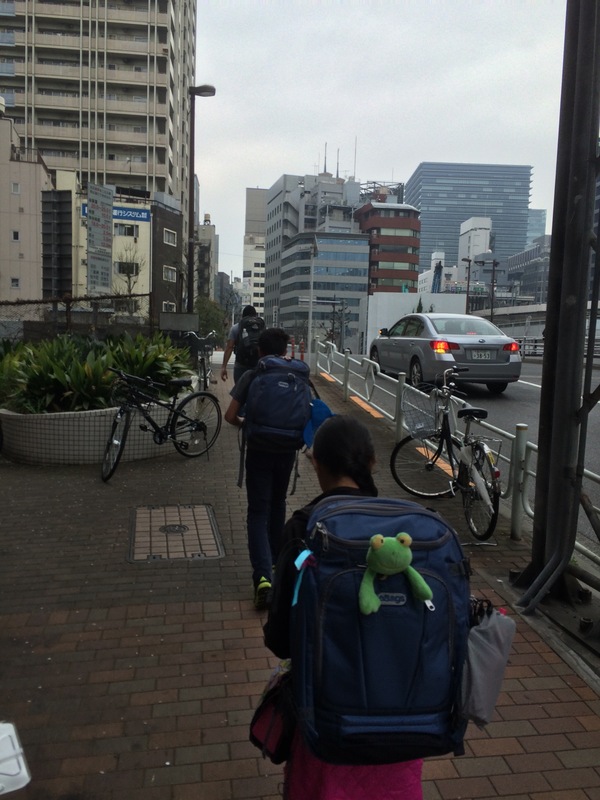 Before our Japan trip in March, Paul spent many hours researching convertible backpacks. The bags carry like backpacks or they can be carried by a side handle or shoulder strap with the backpack straps tucked away. Also, when it is time to access the bags, they unzip and open all the way flat instead of having to reach down into the top to access like a traditional backpack. We ended up choosing a couple different bags, all with many fabulous features. We purchased eBags TLS Mother Lode Weekender Convertible Junior backpacks for the kids because they have a slightly smaller form factor while maintaining the flexibility of several types of compartments. I chose the Minaal bag, with a very simple form factor and fewer sections. I tend to squirrel lots of different things away, so this forces me to stay streamlined and organized. Paul picked the Osprey Farpoint 55 travel backpack which has all of the features we looked for in addition to an attachable/removable day pack. We each also carry a smaller day bag. Paul has the detachable day pack from his Farpoint, Trey and I have side pouches, and Kamaile has a camera case with a tiny bit of storage. Additionally, we purchased a set of eBags packing cubes for each of us. Everyone gets their own color so we can always identify whose stuff is who’s. So, has it worked and do we still like this concept? Absolutely! Time after time we see others struggling with large suitcases as they labor from one train platform to another and are so grateful that we carry everything on our backs. So far, both Asia and Europe have had many stairs, cobblestones, and uneven pavement that makes roller suitcases very impractical. Plus, we have saved lots time and money as we have avoided checking our luggage. One bag does mean a limited number of clothes. But what about laundry? If you don’t have many clothes, you do have to wash them every few days. We have found that it is very simple to wash things in bathroom sinks or bathtubs, or find a laundromat or laundry service. Hotel shampoo actually does a decent job. Keeping up with the laundry only requires a little forethought….You don’t let yourself run out of clean underwear more than once! You also can’t do laundry the night before a travel day because things might not be dry by the time you have to pack up. I know, I know, all you really wanted to know was what I brought in my bag. Again, we started with research. Basically, I scoured Pinterest for ideas. (If you need a starting point, feel free to look at my pins @labunda or Laura Bunda.) There are many many boards for carry-on only traveling for all seasons and areas of the world. The are also tons of ideas for capsule wardrobes. Travelfashiongirl.com is a favorite site of mine. Paul and I have both also learned a lot from Nomadic Matt . com as well as ricksteves.com. Eventually I picked my favorite plan and modeled my wardrobe after it. I, who cannot follow a recipe, cannot follow a wardrobe plan either, it turns out. So I sort of followed this plan. And this one. Very important, because I stick with mostly neutral colors, these 13 or so pieces can be mixed and matched to make many outfits. If you believe the articles and pics on Pinterest, over 25 outfits! 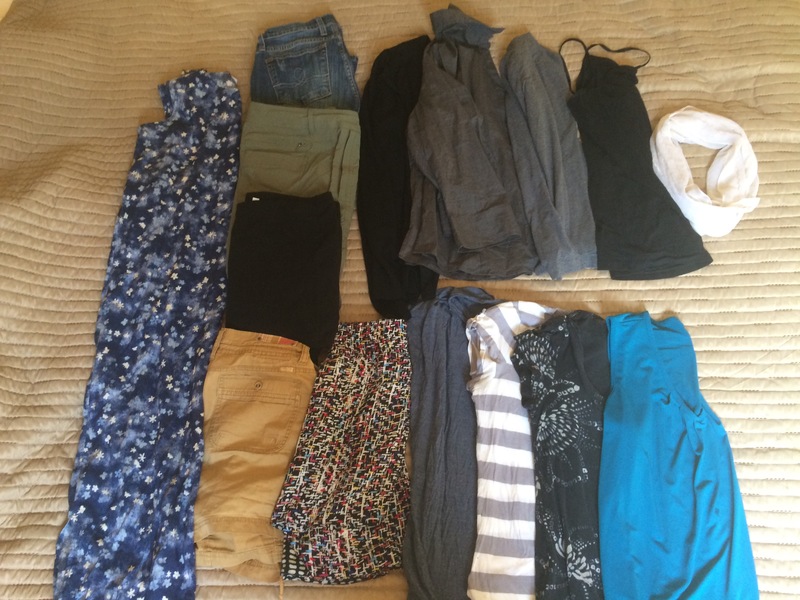 One dress, one pair each of jeans, black leggings, and green travel pants, a pair of khaki shorts, one black cardigan sweater, one 3/4 sleeve charcoal blouse, one gray long sleeve tee, one black cami, one reversible skirt, three short sleeve shirts (one blue solid, one black print, one with stripes), one blue tank top, and a scarf. At the last second I decided to throw in another gray cami that is not pictured. Also not pictured are a rain coat, swim suit, five pair of socks, six pairs of underwear, two bras, and a long sleep shirt. This is pretty much the same type of wardrobe that I brought along to South East Asia earlier this year. Halfway there. 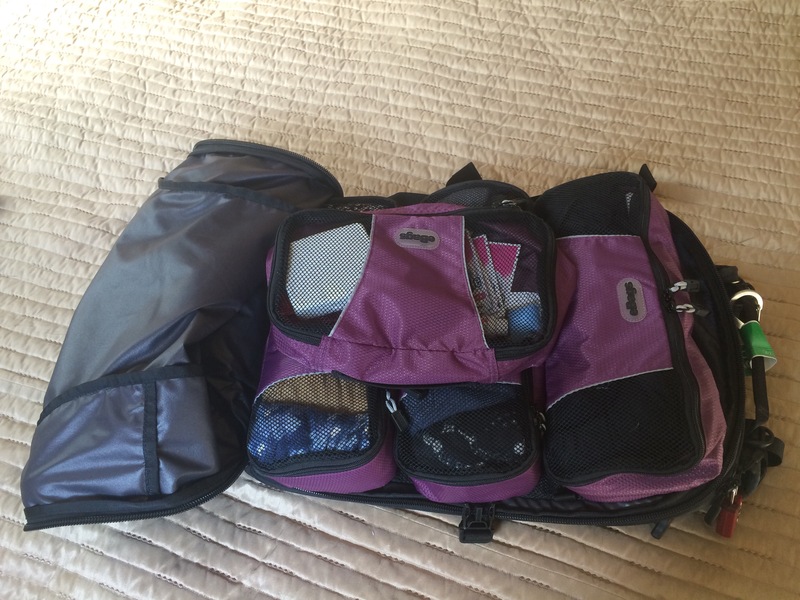 Packing cubes are our friends. My travel outfit consisted of jeans, the gray cami, striped shirt, sweater, and sneakers. Everything else was rolled and put into packing cubes according to category: tops, bottoms, toiletries, and everything else. Together with my bag, this all weighed about 10 1/2 pounds. A few more toiletry items and my Keens were thrown in last minute making my total a little under 13 pounds. Just need to zip the bag closed and I’m ready to go! The next question I often hear: Do you want to burn your clothes by the time you get home? The answer is yes. Some of my clothing pieces I left behind in Indonesia when we departed. Several of the items, however, have earned an encore performance and have come along on this trip as well: reversible skirt, travel pants, charcoal blouse, and black cardigan.One week in and the scheme is holding up well. I have done two sink loads of laundry that hung dry on shower curtain rods and hangers. I think this whole plan is going to work again! 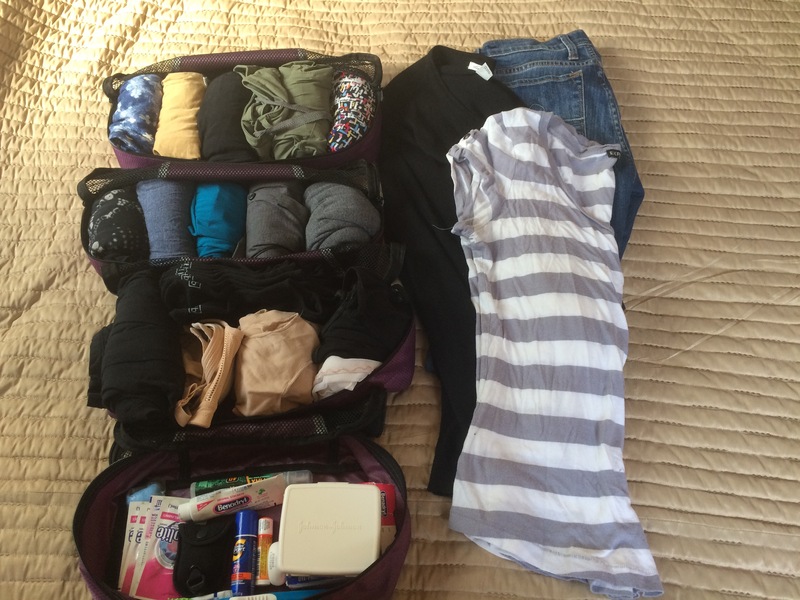 Do you have any stories or advice about packing for traveling? I would love to hear them. 7 days into our 2-month Europe trip & what a blur it has been! Hence, the cover pic (see what I did there?). If what we’ve experienced, thus far, is any indication of what’s to come, then finding adequate time to provide regular, ongoing updates will be a quite a challenge. Therefore, I’ve decided to try and provide a weekly write-up during this time to give everyone slices of the #SeattleBundas life on the road that complement the myriad Facebook, Instagram, and Twitter posts currently provide. As always, feedback is welcome. Monday – Travel Day (Seattle to Frankfurt). We spent the morning doing last-minute packing adjustments, which is tougher than you might think when committed to One-Bag travel. We also finished cleaning the house, changing the linens, etc., just in case family/friends need a place to crash while we’re abroad. • At airport check-in, I expecting a bit of a fight as our assigned seats–for which we paid extra to reserve–were mysteriously changed the night before. To my relief, the Lead Agent happened to be looking over the shoulder of the Agent helping us and fixed things before I even had the opportunity to inquire. • The 10.5-hour flight from Seattle to Frankfurt was long, but not too terrible. Condor Air served us a ton of food, so that was a plus. My seat mate was a large (as in big and muscular) Polish man. Initially, I was irritated that he seemed to take over 25% of my space. 3 hours in, however, and I felt bad that he was having so much more trouble getting comfortable in his seat. 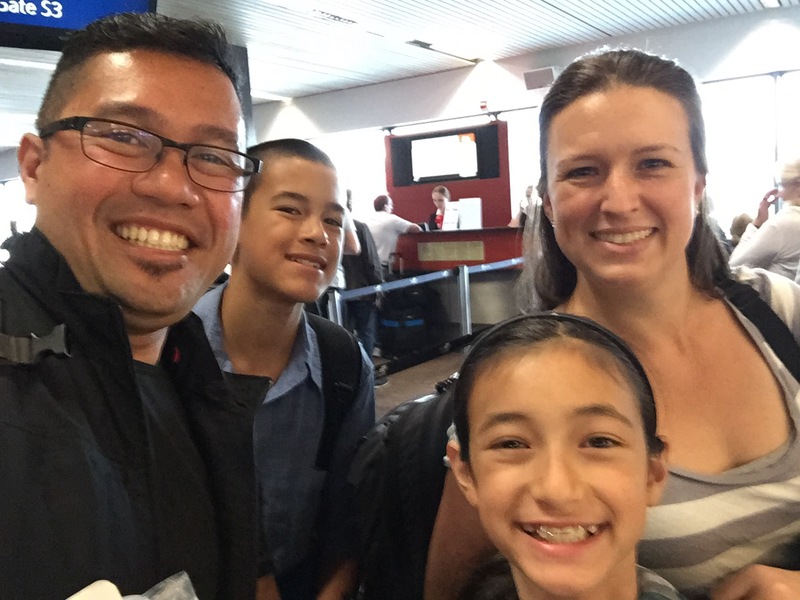 Tuesday – We arrived on Tuesday afternoon and breezed through Immigration. The officer remarked how much he’d have to work to pay for such a long holiday. I told him that I’m certain I’ll be paying for it (in some way) for a while as well. 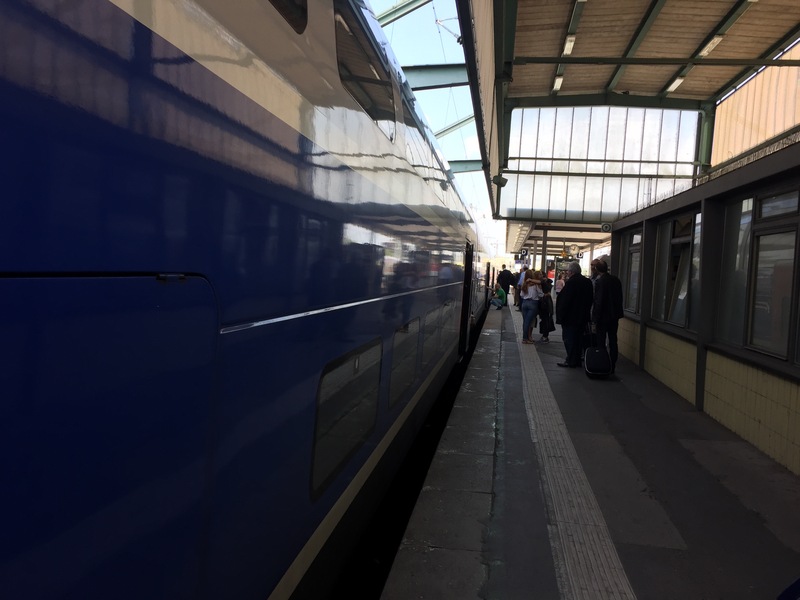 • We took a short walk from the airport terminal to airport train station, then waited in line to activate our Eurail Global Passes. Our transaction was fairly routine, save for a small clerical error that needed sorting. Meanwhile, the scene next to us was quite entertaining. A Vietnamese gentleman was trying to get home via a different train and airport after missing an earlier connection. Meanwhile, his agent hummed the Star Wars Imperial March as he found him an alternate route. What? 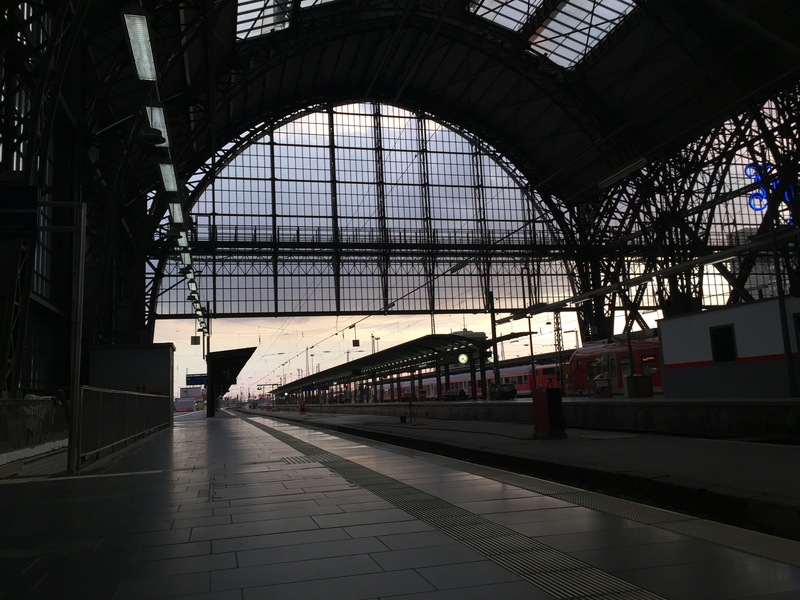 LOL • We took a short train ride from the airport to the main train station in Frankfurt. The station was gorgeous and had me excited for all the other stations that we’d be visiting during this trip. When you live in a city like Seattle, with its woefully inadequate mass transit system, you really appreciate things like this. • After a 10-minute walk, we checked into our hotel. The place was unspectacular, but we ended up getting a 2nd room at no cost when the realized that they forgot to account for our 4th guest request. Score! • That evening, we walked around the surrounding neighborhood and down the the Main River to begin the process of fighting off jetlag. We even found a little playground where the kids could run around a bit. 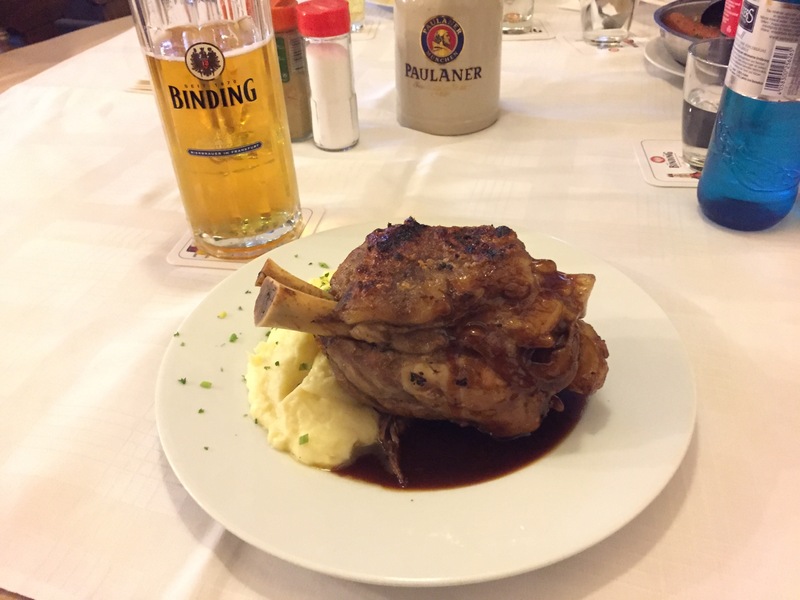 • We finished our very long day with schnitzel, schweinhaxe (pork knuckle), and Binding (local Pilsner) at a nearby restaurant called Baseler Eck. 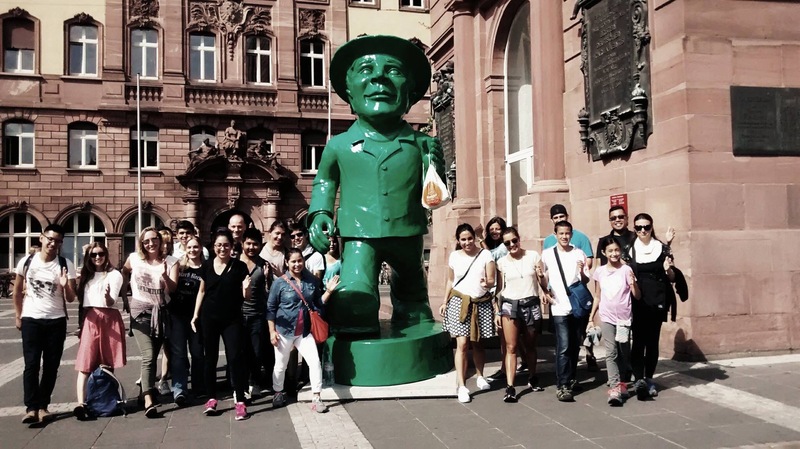 Wednesday – This was our only full day in Frankfurt, so we were determined to make it a meaningful one. Through the course of our pre-trip research, we kept hearing about how boring Frankfurt was compared with other German cities. 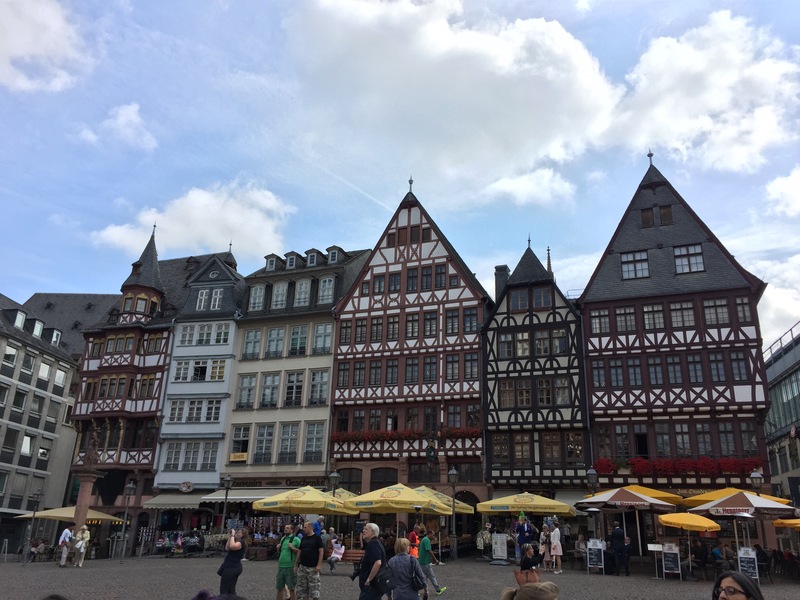 In fact, more than a fair share of contributors from travel sites like TripAdvisor and Trippy recommended other cities when talking about Frankfurt. 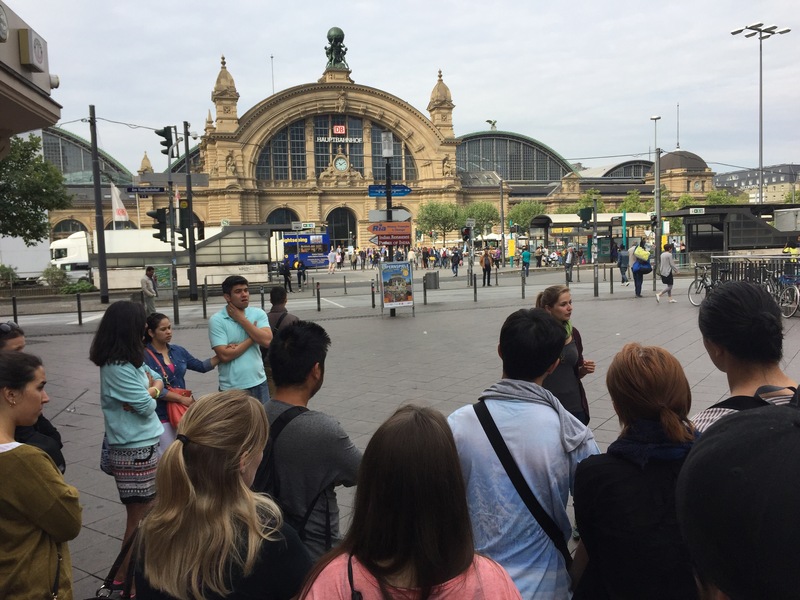 We decided that taking the proverbial road less traveled might be our best bet and hung out with Therese (our guide from the Frankfurt Free Alternative Walking Tour) and 15 other travelers. Therese largely led us away from Frankfurt’s few tourist traps and we learned, among other things, about the city’s efforts to legalize (read: regulate and tax) prostitution and drug use. Needless to say, this required some pre- and post-tour conversations with the kids. • At the end of the tour, a handful of us decided to eat lunch together before going off on our separate ways. Our lives are richer for having spent some time with: Therese, the Socio-Cultural Geology student and Part-Time Guide; Sebastian the Hotelier from Switzerland, by way of Eastern Germany; Justin, the Vietnamese-Canadian on a 6-month European hitchhiking tour; and the British trio on holiday from University. Safe travels, guys! At the start of our walking tour. We soon found ourselves in what could be described as Frankfurt’s Red Light District. 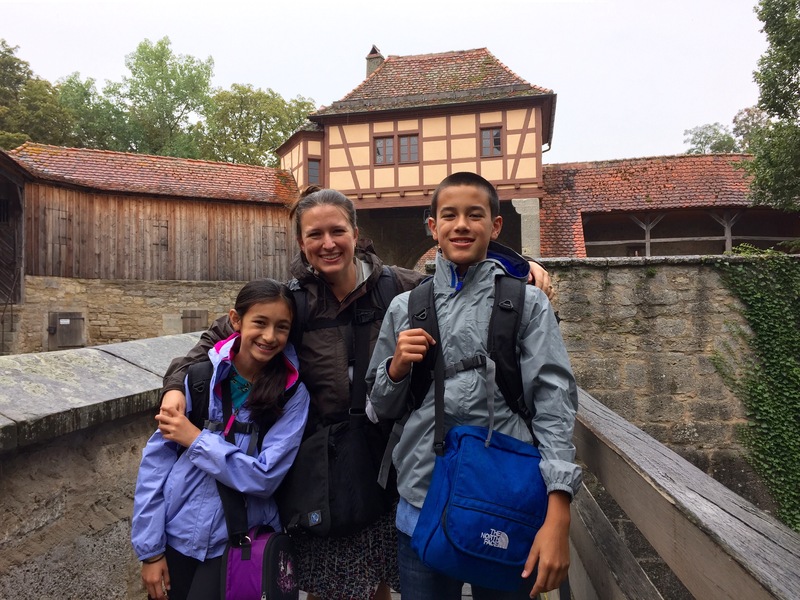 Thursday – We took the morning train to Rothenburg ob der Tauber (RodT), a medieval Bavarian town that was largely untouched for over half a millennia. On a whim, we decided to take advantage of our rail passes by stopping for a few hours in Wurzburg. We had no clue what to expect, but they Interwebs said that the town should not be missed. Wow! 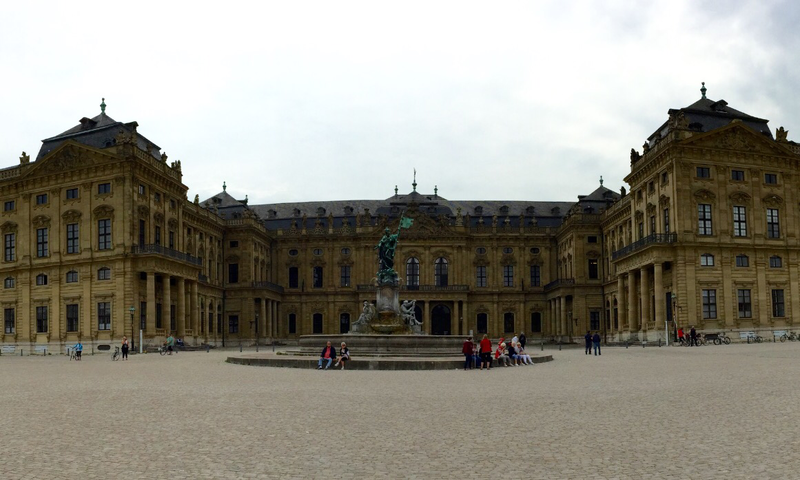 We spent some time visiting the Residenz, a massive and opulent palace built by Bavarian Prince-Bishops. I’d never heard that phrase before, but learned that these guys possessed a combination of secular and spiritual position–effectively giving them absolute power. Ego much? • We made our way to RodT a few hours later and were greeted by our first heavy rain of the trip. Nonetheless, the town walls and buildings were stunning. 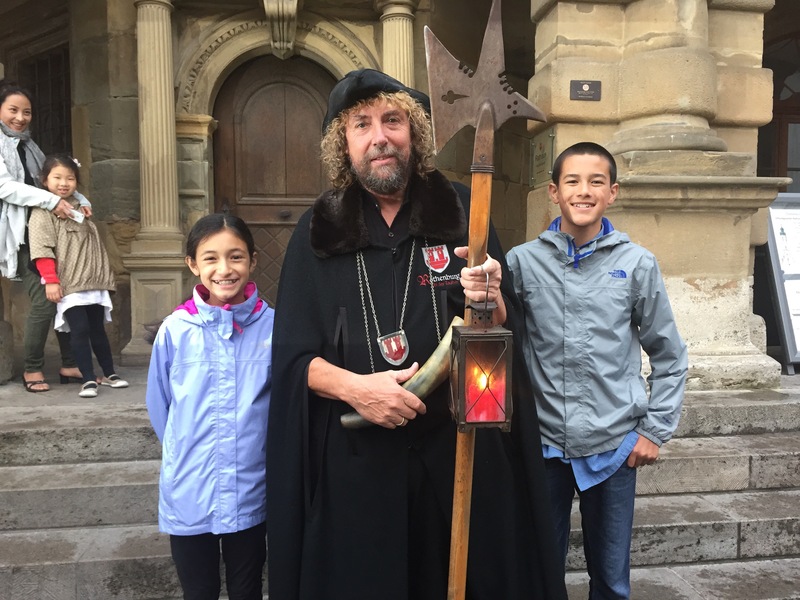 Kamaile leaned over sheepishly saying, “Dad, don’t take this the wrong way, but it’s almost like Disneyland.” LOL • After checking into our hotel near center of the Old Town, we visited a Medieval Crime and Punishment Museum. That place was far too creepy for me, but the rest of the fam seemed to get a kick out of it. 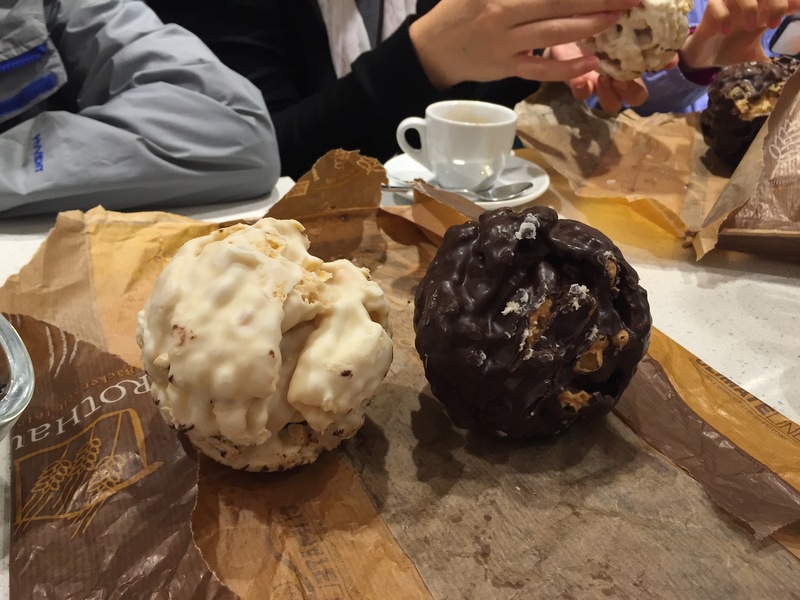 • Not creepy, however, was going upside down with our dinner–beginning with trying out the local pastry called Schneeballs and ending with dinner at a place called Zur Höll (“To Hell”). Let’s just say that eating the best sausages I’ve ever tried in a building with foundations dating back to the 900s was awesome. • After dinner we went on a stroll around the city with The Night Watchman. We heard about this guy from a Rick Steves episode. Corny as they come, but informative and fun! Friday – Our train journey to Paris left at 09:00, so we dragged the kids out of bed for a 06:00 walk. 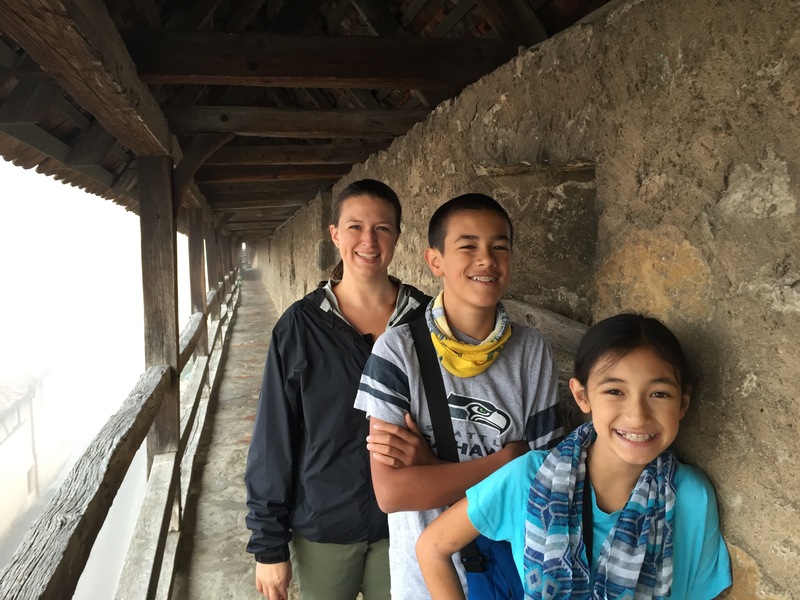 We roamed the foggy, nearly-deserted streets and walked atop and 1000 year-old walls. Many Americans do not quite have the same sense of history that most of the world enjoys, so this was a fantastic experience for the whole family. • 4 different trains over 10.5 hours took us from RodT to Steinach, to Stuttgart, to Strasbourg, then to Marne le Vallee. Just beautiful! That said, I quickly put aside any romantic notions of biking the French countryside; thankful that we were on a comfortable, super fast TGV instead. • Side Note: In Strasbourg, we noticed a group of French military with assault rifles and very serious expressions. We later learned that another TGV was the scene of an attempted terrorist massacre. Thank God for the people–especially the 3 American friends–for laying their lives on the line to prevent a full-blown tragedy. Saturday & Sunday – Consecutive full days at Disneyland Paris and then Walt Disney Studios. I’ll leave it the kids to post a separate blog about our time there. In the meantime, I’ll go ahead and declare now that, for me, Disneyland Paris > Magic Kingdom > Disneyland > Disneyland Tokyo. Until next time…Auf Wedersehen & Au Revoir!